2 Samuel 5:11 Hiram king of Tyre sent messengers to David, and cedar trees, and carpenters, and masons; and they built David a house. 2 Samuel 24:7 and came to the stronghold of Tyre, and to all the cities of the Hivites, and of the Canaanites; and they went out to the south of Judah, at Beersheba. 1 Kings 5:1 Hiram king of Tyre sent his servants to Solomon; for he had heard that they had anointed him king in the room of his father: for Hiram was ever a lover of David. 1 Kings 7:13 King Solomon sent and fetched Hiram out of Tyre. 1 Kings 7:14 He was the son of a widow of the tribe of Naphtali, and his father was a man of Tyre, a worker in brass; and he was filled with wisdom and understanding and skill, to work all works in brass. He came to king Solomon, and performed all his work. 1 Kings 9:12 Hiram came out from Tyre to see the cities which Solomon had given him; and they didn't please him. 1 Chronicles 14:1 Hiram king of Tyre sent messengers to David, and cedar trees, and masons, and carpenters, to build him a house. 2 Chronicles 2:3 Solomon sent to Huram the king of Tyre, saying, As you dealt with David my father, and sent him cedars to build him a house in which to dwell, even so deal with me. 2 Chronicles 2:11 Then Huram the king of Tyre answered in writing, which he sent to Solomon, "Because Yahweh loves his people, he has made you king over them." 2 Chronicles 2:14 the son of a woman of the daughters of Dan; and his father was a man of Tyre, skillful to work in gold, and in silver, in brass, in iron, in stone, and in timber, in purple, in blue, and in fine linen, and in crimson, also to engrave any manner of engraving, and to devise any device; that there may be a place appointed to him with your skillful men, and with the skillful men of my lord David your father. Isaiah 23:5 When the report comes to Egypt, they will be in anguish at the report of Tyre. Isaiah 23:8 Who has planned this against Tyre, the giver of crowns, whose merchants are princes, whose traffickers are the honorable of the earth? Isaiah 23:15 It will come to pass in that day that Tyre will be forgotten seventy years, according to the days of one king. After the end of seventy years it will be to Tyre like in the song of the prostitute. Isaiah 23:17 It will happen after the end of seventy years that Yahweh will visit Tyre, and she shall return to her wages, and will play the prostitute with all the kingdoms of the world on the surface of the earth. Jeremiah 47:4 because of the day that comes to destroy all the Philistines, to cut off from Tyre and Sidon every helper who remains: for Yahweh will destroy the Philistines, the remnant of the isle of Caphtor. Ezekiel 26:3 therefore thus says the Lord Yahweh, Behold, I am against you, Tyre, and will cause many nations to come up against you, as the sea causes its waves to come up. Ezekiel 26:4 They shall destroy the walls of Tyre, and break down her towers: I will also scrape her dust from her, and make her a bare rock. Ezekiel 26:7 For thus says the Lord Yahweh: Behold, I will bring on Tyre Nebuchadnezzar king of Babylon, king of kings, from the north, with horses, and with chariots, and with horsemen, and a company, and much people. Ezekiel 26:15 Thus says the Lord Yahweh to Tyre: shall not the islands shake at the sound of your fall, when the wounded groan, when the slaughter is made in the midst of you? Ezekiel 27:3 and tell Tyre, you who dwell at the entry of the sea, who are the merchant of the peoples to many islands, thus says the Lord Yahweh: You, Tyre, have said, I am perfect in beauty. Ezekiel 27:8 The inhabitants of Sidon and Arvad were your rowers: your wise men, Tyre, were in you, they were your pilots. Ezekiel 27:32 In their wailing they shall take up a lamentation for you, and lament over you, saying, Who is there like Tyre, like her who is brought to silence in the midst of the sea? Ezekiel 29:18 Son of man, Nebuchadnezzar king of Babylon caused his army to serve a great service against Tyre: every head was made bald, and every shoulder was worn; yet had he no wages, nor his army, from Tyre, for the service that he had served against it. Joel 3:4 "Yes, and what are you to me, Tyre, and Sidon, and all the regions of Philistia? Will you repay me? And if you repay me, I will swiftly and speedily return your repayment on your own head. Amos 1:10 but I will send a fire on the wall of Tyre, and it will devour its palaces." Zechariah 9:2 and Hamath, also, which borders on it; Tyre and Sidon, because they are very wise. Zechariah 9:3 Tyre built herself a stronghold, and heaped up silver like the dust, and fine gold like the mire of the streets. Matthew 11:21 "Woe to you, Chorazin! Woe to you, Bethsaida! For if the mighty works had been done in Tyre and Sidon which were done in you, they would have repented long ago in sackcloth and ashes. Matthew 15:21 Jesus went out from there, and withdrew into the region of Tyre and Sidon. Mark 3:8 from Jerusalem, from Idumaea, beyond the Jordan, and those from around Tyre and Sidon. A great multitude, hearing what great things he did, came to him. Mark 7:24 From there he arose, and went away into the borders of Tyre and Sidon. He entered into a house, and didn't want anyone to know it, but he couldn't escape notice. Mark 7:31 Again he departed from the borders of Tyre and Sidon, and came to the sea of Galilee, through the midst of the region of Decapolis. Luke 10:13 "Woe to you, Chorazin! Woe to you, Bethsaida! For if the mighty works had been done in Tyre and Sidon which were done in you, they would have repented long ago, sitting in sackcloth and ashes. Luke 10:14 But it will be more tolerable for Tyre and Sidon in the judgment than for you. Acts 12:20 Now Herod was very angry with the people of Tyre and Sidon. They came with one accord to him, and, having made Blastus, the king's personal aide, their friend, they asked for peace, because their country depended on the king's country for food. Acts 21:7 When we had finished the voyage from Tyre, we arrived at Ptolemais. We greeted the brothers, and stayed with them one day. The most noted of the Phoenician cities situated on the coast, lat. 33? 17 minutes, about 20 miles South of Sidon and about 35 North of Carmel. The date of its foundation is uncertain, but it was later than that of Sidon. It is mentioned in the travels of the Egyptian Mohar, dating probably from the 14th century B.C., and in the Tell el-Amarna Letters of about the same period. Herodotus describes the temple of Hercules at Tyre and says it was built 2,300 years before his time, which would carry back the beginning of the city to more than 2700 B.C. It was a double city, one part on an island, a short distance from the shore, and the other on the mainland opposite. The island city had two harbors, connected by a canal, one looking North and the other South. The island was rocky and the city was fortitled on the land side by a wall 150 ft. high, the wall being of less elevation on the other sides. It was an exceedingly strong position, and is referred to in the Bible as the "strong" or "fortitled" city (Joshua 19:29). The space within the walls was crowded with buildings, and is said to have contained 40,000 inhabitants. The town on the mainland was situated in a plain extending from the Ras el-`Abyad, on the South to Sarepta on the North, a distance of about 20 miles. It was fertile and well watered, the river Leontes (Litany) passing through it to the sea, about 5 miles N. of Tyre, and the copious fountain of Ras el-`Ain, 3 miles to the South, furnishing an abundant supply both for the city and the gardens. (1) Tyre was for centuries subordinate to Sidon, but when the Philistines subdued the latter city, probably in the 12th century. (see SIDON), Tyre received an accession of inhabitants from the fugitives which gave it the pre-eminence. From this time dates its great commercial and colonial activity. Its mariners pushed boldly out to the West and founded colonies in Spain and North Africa, some of which, like Gades, Abdera and Carthage, became famous. They extended their commerce more widely than Sidon had ever done and ventured into the Atlantic and reached the coasts of Britain and West Africa. They reached out to the East also, and had their ships in the Red Sea and the Indian Ocean, and their land routes threaded all Western Asia (see PHOENICIA). 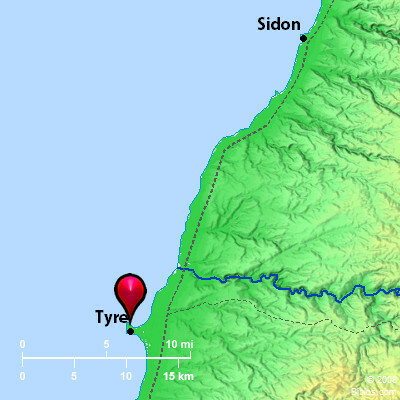 Tyre, like all the Phoenician cities, became subject to Egypt under Thothmes III in the first half of the 15th century B.C., and remained so for some 300 years, but it enjoyed practical autonomy under native kings, being only subject to tribute and to furnishing contingents of ships when the Egyptian kings made their expeditions to the North. In the Tell el-Amarna Letters, dating from the first half of the 14th century, we find a certain Abi-melek (or Abi-milki) writing from Tyre to the king of Egypt asking for aid against the Amorite leader, Aziru, and the king of Sidon, who had joined the rebels. The name is Phoenician, and we know that it was the policy of the Egyptian kings to leave the native dynasts on the throne. (2) After the decline of Egypt, Tyre regained her independence and exercised the hegemony over most of the Phoenician towns, at least as far North as Gebal (Byblus), as appears in the control that Hiram had over the Lebanon forests in the time of David and Solomon. Hiram was evidently desirous of an alliance with Israel, since he sent messengers to David and furnished cedar and workmen to build him a house, apparently without solicitation. The friendly connection between the two kingdoms was advantageous to both, since David and Solomon needed the timber and the skilled artisans that Hiram could furnish, and Hiram needed the food products of the land of Israel (1 Kings 5). Tyre was at this time noted for the skill of its artificers, and its manufactured products were famous throughout the world (see PHOENICIA, 4). The purple dye and works in bronze were especially famous, and Hiram, the Tyrian artisan, was engaged by Solomon to cast the bronzes required for the temple (1 Kings 7:13). Hiram, the king, enlarged and beautified his capital. He united the two small islands on which the city was built by filling up the space between, where he made an open square and built a splendid temple to Melkarth and Astarte. He engaged in commercial enterprises with Solomon (1 Kings 9:26-28; 1 Kings 10:22), both in pursuance of the friendly alliance and also for the advantage of having the use of the port of Ezion-geber on the Red Sea. His brilliant reign lasted 43 years. (3) The list of kings who succeeded him contains the names of Baal-azar, Abd-ashtoreth, murdered by his brothers, the eldest of whom succeeded him, followed by Astartus and Aserymus murdered by his brother, Pheles, who was overthrown by the high priest Eth-baal, showing how disturbed the period was. Eth-baal, or Ithobal, was the king who made an alliance with Ahab and gave him Jezebel, his daughter, in marriage, which proved most disastrous both to her and the country because of the introduction of the Baal-worship into Israel. Eth-baal was an energetic monarch, and is said to have rounded Botrys (Batrun). He reigned 32 years, and was followed by Badezor and Mattan, who gave his daughter, Elissa (Dido), in marriage to her uncle Sicharbas and transferred the throne to them; but they were set aside by an uprising of the people, and Pygmalion, son of Mattan, was placed on the throne, and Sicharbas put to death. Elissa fled with a party of nobles, by sea, to Africa and founded the city of Carthage. This happened about the middle of the 9th century B.C., Josephus putting it at 860 B.C. (4) In the first half of this century Tyre became subject to Assyria, and her hegemony in Phoenicia came to an end, but her prosperity was not seriously checked as we may infer from Isaiah 23:8, which was written a century or so later. Assyria was satisfied with the payment of tribute until the time of Tiglath-pileser III (745-727), who laid a heavier hand upon her, and this led Elulaeus, king of Tyre, to form a confederacy of the Phoenician cities against Assyria. Shalmaneser IV subdued all except Tyre, which he distressed by cutting off her water-supply. But the people dug wells and obtained enough to subsist upon for five years, when Shalmaneser was killed and Elulaeus recovered control of his territory. He was not molested by Sargon, but Sennacherib advanced against him with 200,000 men, and Elulaeus fled to Cyprus. The citizens made a successful resistance and Sennacherib did not take Tyre, but it submitted to Esar-haddon, and its king, Baal, obtained the special favor of the Assyrian king, who made him ruler of all the coast cities from Dor to Gebal, and the Lebanon was placed under his control (680-673 B.C.). It is rather surprising that Baal refused to assist him in his attack upon Egypt and that Esar-haddon did not punish him, probably because he was too much occupied with Egypt. Ashur-banipal, however, did compel him to submit and to give him his daughter, and those of his brothers, as secondary wives, but left him as king of Tyre. (5) On the decline of Assyria, Tyre regained its independence, and its greatness is indicated by the fact that it resisted Nebuchadnezzar 13 years (598-585); it is uncertain whether the island city was taken, but it evidently came to terms with the king of Babylon (compare Ezekiel 27:26; Josephus, Ant, X, xi, 1 and see The Expository Times, 1899, pp. 378, 430, 475, 520). After this siege Sidon took the lead and Tyre was in a disturbed state: the monarchy was overthrown and suffetes, or judges, took its place for six years, when the old order was restored. The decline of Babylon enabled Tyre to regain her independence for a short period until its submission to the Persians about 525 B.C., and thenceforth it was a vassal state during the continuance of the Persian empire. (6) It was by no means hindered in its commercial prosperity, and its great strength is seen in the brave and energetic resistance it made to Alexander the Great. All Phoenicia submitted to him without resistance, and Tyre was willing to admit his suzerainty, but declined to receive him into the city. This so angered Alexander that he at once commenced a siege that proved the most difficult undertaking in all his wars. He had no fleet and was obliged to build a mole (causeway) from the mainland to the island, but before he could finish it the Tyrians destroyed it and beat back their assailants handily. Alexander had to do the work all over again, and since he was convinced that without a fleet he would not be able to take the city, he procured ships from the Phoenician towns that had submitted, and with the aid of these was able to blockade the port and prevent the besieged from issuing forth to destroy the new causeway. This was at length pushed up to the very wall of the city, which was finally breached, and the troops of Alexander forced their way in. But even then the defenders would not yield, and the king himself had to lead the assault upon them with his bodyguard and put them all to the sword. Those who died with arms in their hands were 8,000, and the survivors, women, children and slaves, to the number of 30,000, were sold in the open market. He placed over the ruined city, into which he introduced some colonists, a certain Abd-elonim, and left it after having spent about seven months in subduing it. (7) After the death of Alexander, Tyre passed into the hands of Ptolemy Lagi, and when Antigonus, in 314 B.C., took Phoenicia from him, Tyre resisted, and he had to blockade it 15 months before it would yield, showing how quickly it had recovered from its previous disaster. It became a part of the Seleucid kingdom when Antiochus III drove the Ptolemies from Syria (198 B.C. ), and the Seleucid kings regarded it of importance and gave it the right of asylum, and it was allowed the status of a free city by the Romans, Antony recognizing the magistrates and council of Tyre as allies. When the Parthians attacked and took Syria, in 40 B.C., Tyre would not submit and was left untouched, being too strong for them. Augustus deprived it of its freedom, but it was given the status of a "metropolis" by Hadrian, and this title appears on its coins. (8) Tyre is mentioned in the New Testament several times: Christ visited its territory (Matthew 15:21 Mark 7:24), and people from there came to hear Him (Luke 6:17). Herod Agrippa I had trouble with Tyre, and a deputation came to visit him at Caesarea (Acts 12:20). Paul visited Tyre on his journey from Asia to Jerusalem (Acts 21:6-7). Christianity was accepted by the people of Tyre, so that the 2nd century A.D. saw a bishopric established there, and in the 4th a council was held there to consider charges against Athanasius, by the party of Arius; he was condemned, a decision which brought the Tyrian church into disrepute. Tyre was already obnoxious to Christians because the anti-Christian philosopher Porphyry was from there. Tyre continued a commercial center, and Jerome says that it was the noblest and most beautiful of the Phoenician cities and an emporium of commerce for almost the whole world (Commentary on Ezekiel). It was of considerable importance in the Crusades and continued so until toward the end of the 13th century, when its trade declined, and it has now dwindled to a town of some 5,000 inhabitants. For "literature" see PHOENICIA. TYRE, or Tyrus, now Sur, on the eastern coast of the Mediterranean, 102 ms. n. by w. of Jerusalem. Pop. about 5000. The city stands out into the sea, and is connected, by a narrow neck of land, with the main shore.